This recipe is to celebrate my vacation in the islands! I hope you enjoy it as much as I do. It may be snowing and below zero where you are now but that doesn’t mean you can’t have a little something tropical. In a bowl combine mango, red onion, cilantro and avocado. In a small bowl whisk together apple cider vinegar, honey, lime juice and salt. Add liquid to bowl and stir. This festive salsa is a great topping for fish or it can be enjoyed as a side. I hope this recipe brings you day dreams of the islands or makes you think about taking your own vacation. Vacation is good for the soul, just like this salsa is good for your body! Merry Christmas to You, our wonderful Paleo friends! Since Christmas is a time to be thankful, we wanted to let you know just how grateful we are to you for sharing this journey to health with us. Your friendship, comments, advice and support are what keep us going and words can’t adequately express just how appreciative we are, Thank You. Christmas is different in every household. Mince Pies were a staple holiday treat throughout my childhood in South Africa. My boyfriend’s Italian heritage meant that family style pasta was a tradition at his family Christmas gatherings. What is your Christmas tradition? We would love to hear it! And have you been able to make that tradition Paleo? Since I left South Africa (over eight years ago now) I have craved Mince Pies. I’m not quite sure why they are not a huge hit here like they are back home, but I am determined to change that! Mince Pies are not mincemeat pies–they are the traditional English Christmas treat with stewed fruit and festive spices–or in other words, pure deliciousness! 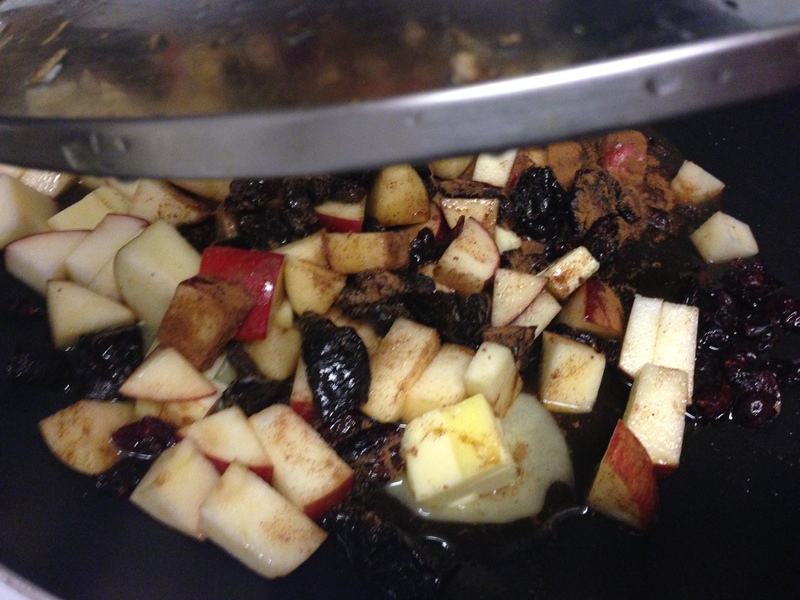 In a medium pot or large sauté pan, bring all of the Pie Filling ingredients to the boil, then reduce the heat slightly and cook for about 30 minutes, stirring occasionally. 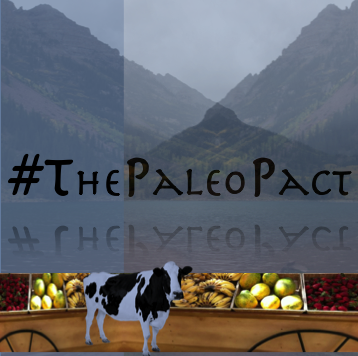 While the filling is cooking, make the Paleo Pie Crust. Once the Pie Crust has baked, reduce the oven temperature to 350 degrees F.
Let the pie filling mixture cool before scooping it into the baked Paleo Pie Crust. 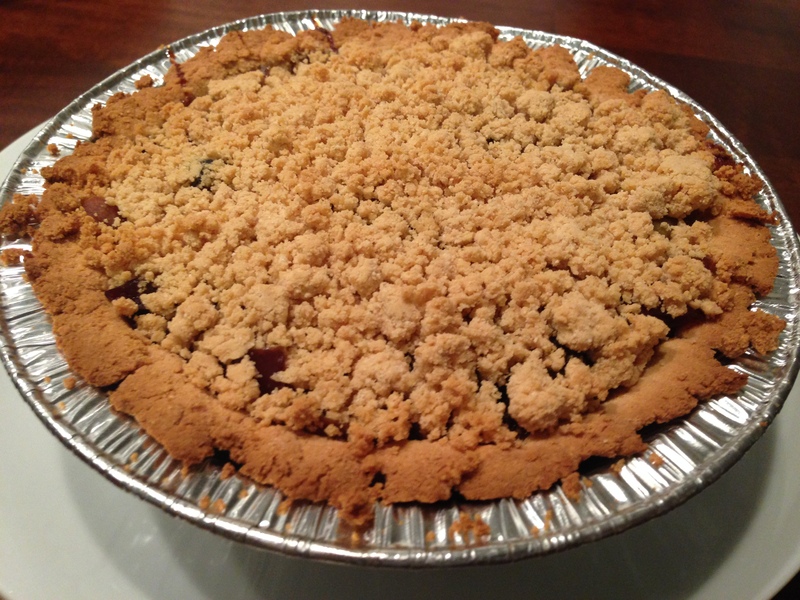 Top the mixture with a thin crumbled layer of unbaked Paleo Pie Crust dough to ‘seal’ the pie. Place it in the oven to bake for another 30 minutes. Remove the pie from the oven and let cool for at least 15 minutes before serving. 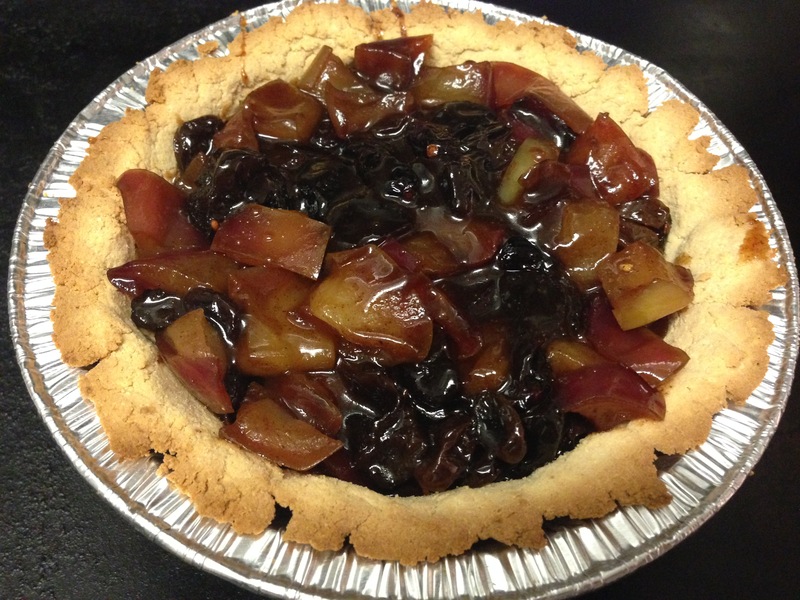 Tip: The pie filling can also be made in advance and refrigerated for a few days, or frozen and used later when a Christmas Pie craving kicks in. There is just something special about serving a golden-brown roast chicken. Whether you are cooking up a feast for yourself, or preparing a festive dinner, a stuffed chicken roast makes a wonderful center stage to any meal, and is truthfully quite easy to make. This recipe combines the sweet flavors of caramelized apple with the savory taste of thyme to form a delectable combination that looks good and tastes great. Plus, with those two ingredients added to the dish, you suddenly have a protein dish that is enriched with vitamin C, iron, manganese and fiber. 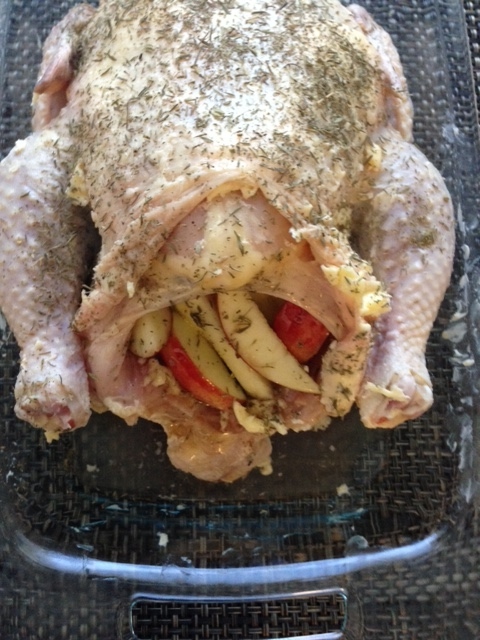 Place the chicken upside down in the center of a large oven dish and separate the legs. Reach under the skin and coat the chicken with a generous amount of grass-fed butter on all sides. Sprinkle the chicken exterior with two teaspoons of thyme spice. 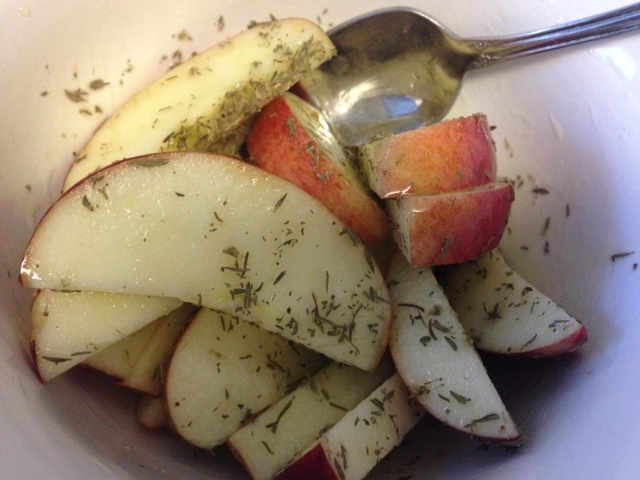 In a small bowl, mix the apple slices with the honey/agave and another teaspoon of thyme spice. Once mixed, place the apple and honey/agave mix in the opening between the chicken legs. Place the stuffed chicken in the oven for 25 minutes. Turn the oven temperature down to 325 degrees F and continue to cook the chicken for about another 45 minutes to an hour. Once the chicken is well cooked (the interior temperate on a thermometer reaches 165 degrees F), remove the bird from the oven and allow it to sit for at least 10 minutes before slicing and serving. When serving, scoop the stuffing out with a spoon and serve it alongside the chicken. Drizzle the natural juices from the oven dish over the chicken pieces to provide extra flavor and moisture to the dish. Note: While this recipe calls for the removal of the neck and giblets to make room for the stuffing, these parts of the chicken are excellent sources of protein. They can be added to the dish when the oven temperature is turned down part way through the recipe, or kept separate and cooked later on the stove top. To learn more about Nose To Tail eating, click here. These peppermint cookies are amazing and a perfect treat for the holidays! If you need to bring a treat to a holiday party consider these your go-to. You can also top these with Paleo frosting to make them more festive! Place foil or parchment paper sheets over your baking sheet. This will prevent your cookies from sticking. Brew 3 oz. of Peppermint Tea. Add the dry ingredients, water, agave and tea to the butter and sugar mixture and beat until well combined. Place the cookies on your lined baking sheet and bake for 12-14 minutes. Giving these cookies enough time to cool is critical, if you serve them warm they tend to be a little crumbly. For more fantastic cookies take a look at our Giveaways page to see how you can get your free copy of Quick & Fantastic Paleo Cookies. It seems to have been commonly accepted that omegas, despite their high natural fat content, are necessary for human health. Our bodies don’t produce these fatty acids naturally, so we need to get adequate amounts from food in order for our cells to function. What is still in question however, and what surfaces more and more with the growing amount of vegetable oils on our shelves and in our food, is the question of the appropriate omega 3 to omega 6 ratio. What’s the difference between omega 3 and omega 6? Both are polyunsaturated fats, also known as fatty acids. Omega 3 is primarily found in fish, such as salmon and tuna, as well as in walnuts and flaxseed. Omega 3 aids the body with blood thinning and reduces inflammation. Omega 6 comes largely as linoleic acid from plant sources, such as corn oil, soybean oil and sunflower oil. Omega 6 helps with blood thickening and immune response. Both fatty acids are vital components of the human diet, however, due to the large amount of vegetable oil, processed food and candy that contain high doses of omega 6, the average American is getting a much greater amount of omega 6 than necessary, and too little omega 3. Why is the omega 3 to omega 6 ratio important? 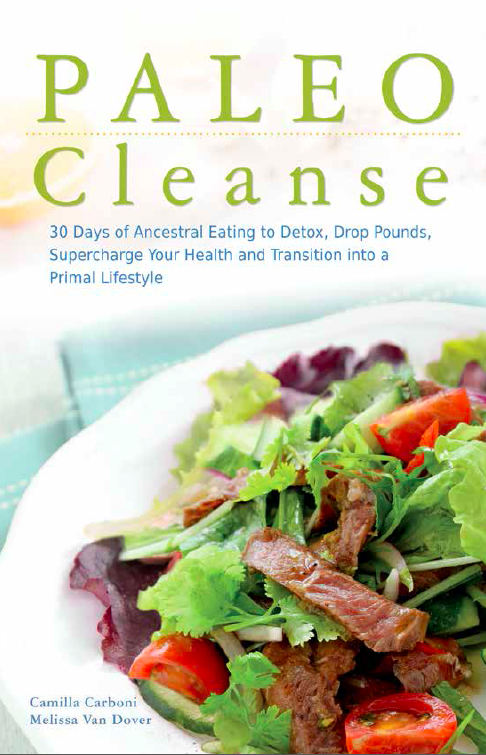 Because each of the omegas have opposite functions, a healthy body relies on a balance of both fatty acids. An excess of omega 6, so common in the Western diet, is thought to be directly related to the increase of diseases like asthma, heart disease and cancer, and attributing to the alarming rise of obesity and depression. What are a few easy ways to ensure I maintain a good omega 3 to omega 6 ratio? This salad is delicious and packed full of fiber. If you like pickled foods you’ll enjoy this a lot. I add this as a side for chicken dishes, but it’s also great for anything flavored with coconut aminos. It a Tupperware container add cucumbers and carrots. In a small bowl whisk together vinegar, water, lime juice, honey and salt. Add liquid mixture to Tupperware. Close Tupperware and shake to mix. You can play with the portions here, some individuals like it more “vinegary” so they could add more vinegar to achieve this flavor. The great thing about this recipe is that you can make it work for you, it just takes a little adjustment to get everything going.